BRYAN EATON/Staff photo. Bresnahan School third-grader Seamus Dolan, 8, reaches for the ball in physical education class where the Similarities Awareness program, from Northeast Passages, was facilitated by the school's physical therapist Jill Grelle. 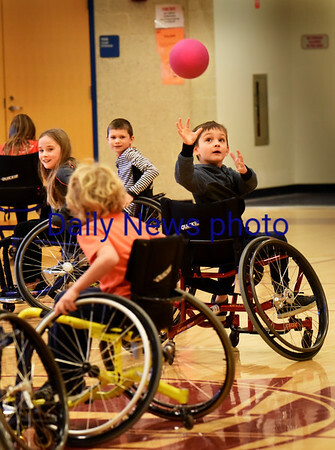 The program teaches students that we all share similarities and to consider that using a wheelchair while playing a sport requires skill and practice and is also challenging, athletic and fun.